Does your sensitive or "lazy" horse not respond so smoothly to pressure? Are you really an "Alpha" leader, at heart? Does your horse trust and respect you as much as you hoped he would? Join us and gain new insight about what's really going on inside your partnership in terms of the ultimate measure: the Feel between you and your horse. What's in your Feel defines your partnership. Why? Because Feel is the main thing your horse has to go on - it's how he's "wired". Your Feel is the direct line to your horse, when it's aligned with who You are and applied with clarity that fits Your Horse. Find out how common practices could be tripping you up and which of 4 aspects of Feel is your particular key to "closing the gap" for you and your horse. Follow this self-guided assessment "Inside Your Partnership: The Stealth Saboteurs" (download it for free). Does your sensitive or 'lazy' horse respond well to pressure? Are you a good 'Alpha' leader? Are you 100% comfortable about "escalating pressure" to get what you want from your horse? Are you an "Alpha" leader, at heart? I wasn't either. Because you know deep down Your Horse doesn't exactly like that 'discomfort' from you! If you have a nagging feeling there is "more" in your horse you can't seem to quite reach... you're right! The downside of "Alpha" strategies is that the Feel we offer (such as driving our horse away on the ground or escalating discomfort until he 'submits' to our lead) is really one of “separation” instead of a Feel of “unity”. 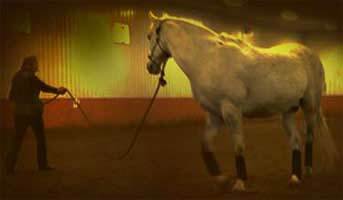 This creates “static" on the line between you and your horse, interfering with clear, harmonic flow. Whether you are enjoying a trail ride, working in an arena, handling a dicey moment or resolving well-rooted trouble-spots, Feel is the bridge from strife to a forever journey of deeper access to your horse. When your creativity meets your horse's creativity in connection with the same plan, you discover you and your horse's higher capacity for true partnership in all that you do together. 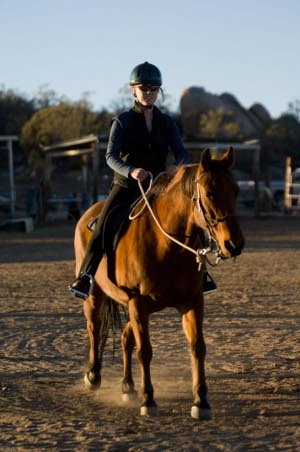 When I started coaching clinic students "The 4 Keys to Harmonic Flow" and framework of principles within each key, it became their roadmap and GPS to a higher level of connection with their horses. Now it’s here on-line - for you and your horse! 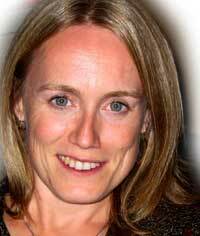 Join us to discover how Feel really works and how to apply it with clarity. To find out what Feel is really about, there's a collection of common practices that are notorious for undermining your feel and therefore your connection, often without you knowing it: I call them the Stealth Saboteurs. Follow my self-guided assessment “Inside Your Partnership: The Stealth Saboteurs” to identify your Stealth Saboteurs within each of The 4 Keys that determine Feel. 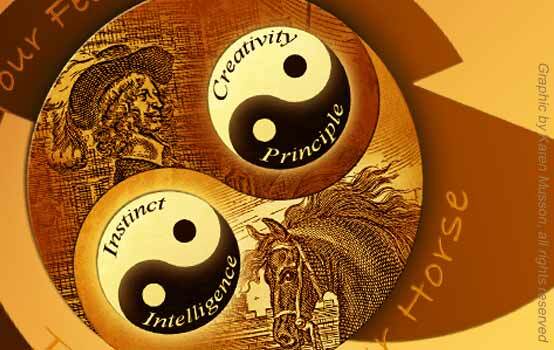 Find out which Key will help you the most personally to unlock more in your horse and deepen your partnership. 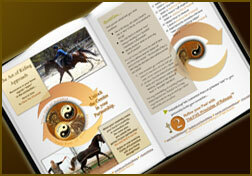 Immerse into Your Horse, Your Horsemanship. Yum. 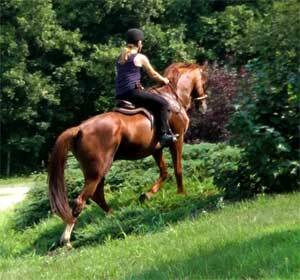 Is your sensitive or "lazy" horse not responding so smoothly to pressure? Are you not a natural "Alpha" leader at heart, or just not really wired to "dominate" your horse? Your Feel is the direct line to your horse - when it's aligned with who You are and applied with clarity that fits Your Horse. What's in your Feel defines your partnership. It's the main thing your horse has to go on. It's how he's wired. Find out which of 4 aspects of Feel is your particular key to "closing the gap" for you and your horse without the dependency on pressure to release or use of treats to let your horse know he's right. Take it easy! The captivating ease between Fred and Ginger (left) depends on the ongoing feel of release offered within Fred's lead. 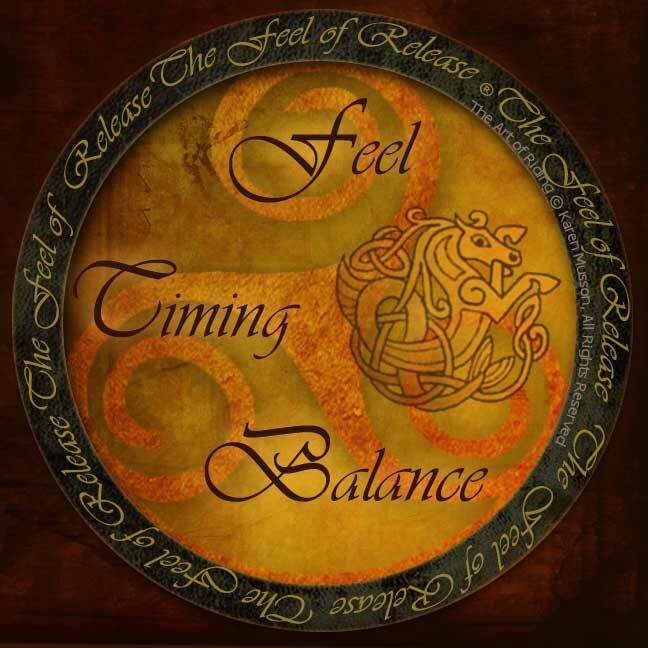 He blends with, supports or invites their next move, timed to complement her balance - as he feels of her mind. The connection leaves Ginger in no doubt whatsoever about following Fred's feel. I discovered Bill's approach after coming to the US. 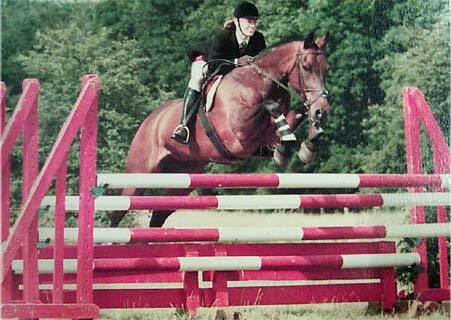 I grew up in France, and started out with horses in the French tradition, known for its lightness. Bill's work, influenced by the old masters of the French cavalry, resonated with that earlier foundation and I craved what he in turn added: Bill called it our 'better feel'. It is a feel that releases the horse's mind into your finger tips. 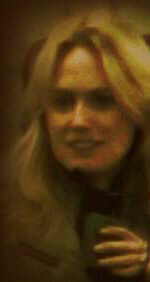 I traveled to ride in clinics all over, with those closest to Bill's work. Bill knew what the horses need us to know. His teachings will forever shape how I handle horses and ride. That 'better' connection through feel serves in all things, from going out to feed at night, trimming feet in the pasture or caring for an injury, to riding in the woods or jumping a fence. It brings me more joy with horses than I ever imagined. "Feel" can seem elusive. It does not need to be! I can help you develop and enjoy "Feel" in a way that bridges from your existing background, adds to that value, and prepares you to make the most of the real key: your creativity. 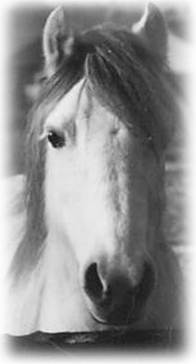 I invite you to come and enjoy a true Clarity of Connection with your horse today. "The Feel of Release" refers to an ease of connection, alive in an ongoing flow between horse and rider, whether riding around the farm, out blazing a trail or in the show ring - the better the feel of the connection, the better and more enjoyable the performance. 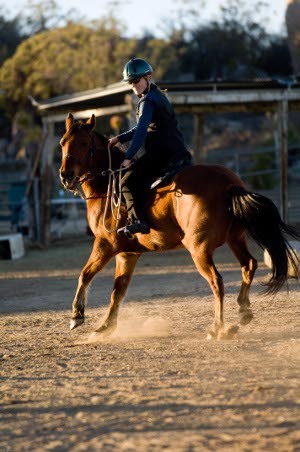 We all face challenges with our horses at one time or another - perhaps he bucks, runs off, won't go, doesn't pick up a canter lead well, resists our requests for a particular maneuver or we just cannot seem to get his attention. It is important to note that virtually ALL tricky spots have one thing in common - our horse's resistance or tension: "brace". But here is the Catch 22. 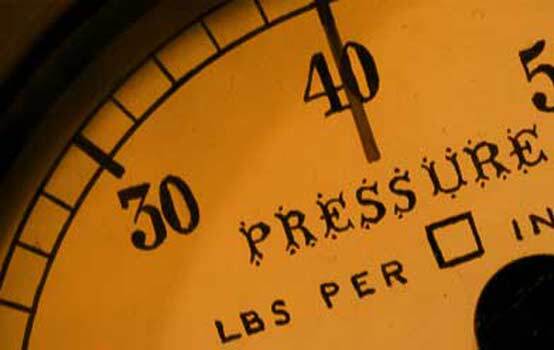 We often respond to "brace" with an escalation of pressure or of the aids. However in our application of pressure, we usually hold our breath and become tight as we offer tension - we reciprocate the brace we were seeking to eliminate. 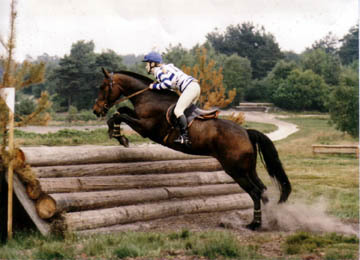 Not only that, brace between horse and rider practices a lost connection - which is the part of riding that brings up the most anxiety or concern, and is then apt to amplify the disconnect. And that... is not fun. While brace produces more brace, the good news is release produces more release - and with it, access to the mind, feet, and a mellow, available horse. When the Connection is Right. The gift of "Feel" is in each of us for the asking. It is the direct line to the whole horse. But why...? And, how...? Join us to find out and enjoy! Imagine for a moment. . .
How would this image change, if Fred tried to correct Ginger's flow? Imagine. . . if Fred lost his feel for Ginger's balance, relative to her steps? Imagine. . . if he didn't 'open the door' at the right time and invite her through? Imagine. . . if, as he led their dance, he stopped feeling of her mind? What would happen to their connection? Any of these smaller things would short-circuit the captivating ease between them as Ginger follows Fred’s feel. The performance would lack the heart that fuels it. It is not so different with our horses. To shape a horse through release, we need a feel of release *in us* to offer - only then can we receive the feel of the horse "through" us, and back into our hands to shape what small change fits next. True feel is not applied by us "to" the horse but "through" us from the horse.